We usually do our baking at home but once in a while- mainly for novelty sake, and cos I don’t always wish to have to clear up; we head over to TOTT Store (next door to us!) 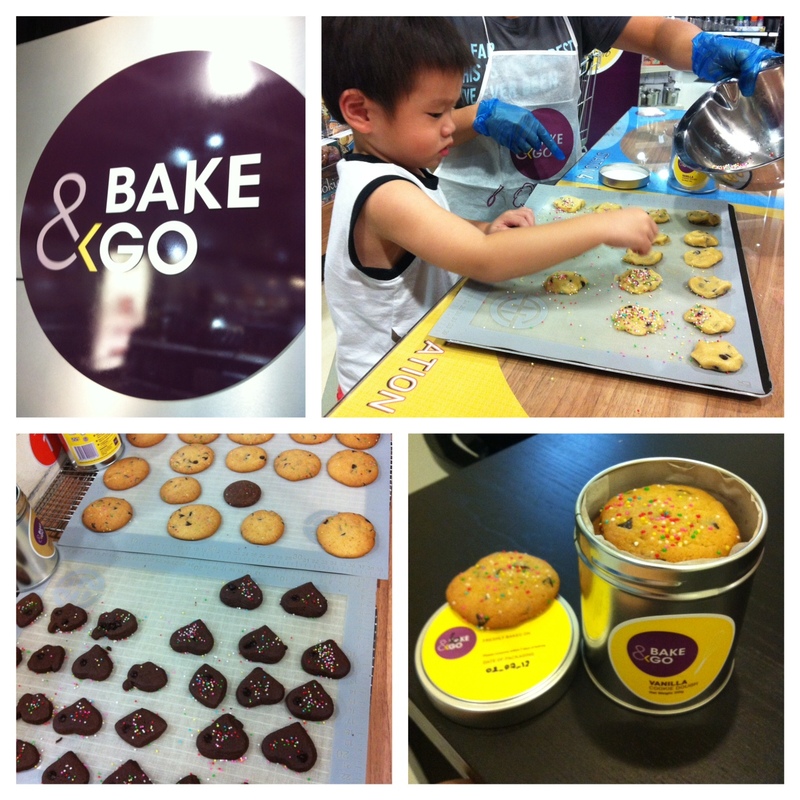 for a spot of baking at their Bake & Go section. Its mainly for parents with kids to leave them somewhere for a stint while parents go shopping but, still, its a great place for kids and even parents to spend sometime doing stuff together. For S$12.80 (inclusive GST) you get an apron and your own tin of cookie dough (available in chocolate, vanilla and strawberry) and a some choc chips. You can buy other additives for a small fee; Q usually goes for the rainbow sprinkles. And you’re ready to go! The nice uncle in charge (maybe there’s an aunty too, but we’ve always only ever met uncle Cookie) ushers you to your own baking station and you bake away. They have cookie cutters for use if you prefer a slightly more structured cookies. We personally just like to flatten them out. Once you are done, Uncle Cookie (that’s what he told Q his name was) sends them into the oven and you come back in about 20 minutes and pack your own cookies into the now empty cookie dough tin. This entry was posted in Uncategorized by matchingsocks. Bookmark the permalink.